Can Governors Refuse Entry to Syrian Refugees? In response to the deadly attacks last Friday in Paris believed to have been committed by Syrian-born members of ISIS, at least 31 state governors have declared their intent to refuse entry into their states of refugees fleeing Syria. Governor Doug Ducey of Arizona (shown), for example, issued a strongly worded statement of his state’s intended refusal to allow settlement of Syrian refugees. 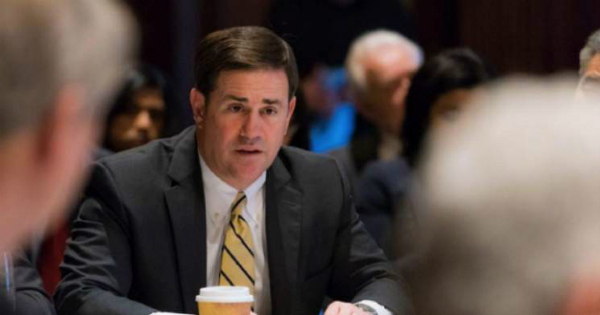 “Given the horrifying events in Paris last week, I am calling for an immediate halt in the placement of any new refugees in Arizona,” Ducey declared. As with any question of superiority between state and federal policies, there are those who instantly assert the “supremacy clause” of Article VI in defense of giving the feds the upper hand. The fact is the Supremacy Clause does not declare that all laws passed by the federal government are the supreme law of the land, period. A closer reading reveals that it declares the “laws of the United States made in pursuance” of the Constitution are the supreme law of the land. In pursuance thereof, not in violation thereof. Dismissing, then, with the “supremacy clause” argument is relatively easy. The problem remains, however, of whether the Constitution gives the federal government authority to grant entrance to the United States to those seeking asylum. And a related question: Did the states grant to the federal government in the Constitution the power to put labels on immigrants, labels which remove them from any exercise of state sovereignty? As this reporter has written on other occasions, the closest the Constitution comes to placing anything even incidentally related to immigration within the bailiwick of Congress is found in the clause of Article I, Section 8 that empowers Congress to “establish an uniform Rule of Naturalization.” That’s it. There is no other mention of immigration in the text of the Constitution. Somehow, though, the enemies of the right of states to govern themselves have extrapolated from that scant reference to “naturalization” the exclusive and unimpeachable right to legislate in the arena of immigration. The difference between immigration and naturalization is one of definition. Immigration is the act of coming to a country of which one is not a native. Naturalization, however, is defined as the conference upon an alien of the rights and privileges of a citizen. It is difficult to understand how so many lawyers, judges, and legislators (most of whom are/were lawyers) can innocently confuse these two terms. Before the states sent delegates to a convention in Philadelphia in 1787 to amend the Articles of Confederation (the result of which was the Constitution), they were already defending their sovereign borders by setting rules governing the means by which one could lawfully enter the state. That is to say, they were policing the immigration of aliens, an act undeniably within their right as a sovereign government. On not one single occasion during that summer of 1787 did any one of the 55 (on and off) representatives of the 13 states suggest the endowment of the new national government with the authority to set immigration policy for the entire nation. That is significant. Not even the most strident advocate of a powerful national government ever proposed granting the power in question to the central authority. In fact, the sole reference to the federal government’s power to regulate immigration is Article I, Section 9 wherein Constitution forbids Congress from interfering in the “migration or importation” of persons into the several states until 1808. That this limitation touched and concerned the slave trade and only the slave trade is patently obvious to anyone reading the debates of the delegates as recorded by James Madison and others who were present at the time. In fact, the wording of Article I, Section 9 is precisely worded so as not to be confused with any other article of the Constitution. There was a time in our nation’s history when this wasn’t such a difficult distinction to grasp. It seems we should accept that the Constitution’s silence on the issue of immigration and the 10th Amendment’s explicit reservation to states of all powers not granted to the federal government means that state governments can establish the policy they deem proper with regard to who can or cannot settle within their sovereign borders. That’s not the end of the controversy, however. There are those who insist that the 1915 Supreme Court decision in the case of Truax v. Raich should be the final word on the subject. At issue was the constitutionality of an Arizona law designed to prevent unwelcome foreigners from settling in that state by denying them the ability to secure meaningful employment. Under the terms of Arizona’s “act to protect the citizens of the United States in their employment against non-citizens of the United States, in Arizona,” all businesses with more than five employees were required to maintain a workforce that was comprised of at least 80 percent “qualified electors or native-born citizens.” As a direct result of this legislation, an Austrian-born cook named Mike Raich lost his job. Raich filed suit and eventually wound up before the Supreme Court. Put differently, Congress possesses the constitutional power to regulate the admission of aliens to the United States. Once an alien has been lawfully admitted under federal law, no state may “deny them entrance and abode.” That standard plainly covers the treatment of Syrian refugees that have been lawfully admitted to the United States. Is the Supreme Court designated the ultimate decider of issues pitting state sovereignty against federal prerogatives? Thomas Jefferson had something to say in the matter. In 1804, he wrote that giving the Supreme Court power to declare unconstitutional acts of the legislature or executive “would make the judiciary a despotic branch.” He noted that “nothing in the Constitution” gives the Supreme Court that right. In this Mexican standoff of states, Supreme Court, and federal government, the last man standing is the people acting in their collective political capacity as states. Abraham Lincoln recognized the lack of constitutional authority for the Supreme Court’s assumption of the role of ultimate arbiter of an act’s conformity with the Constitution. In his 1887 book The Constitutional Law of the United States of America, renowned German-American constitutional scholar Hermann Von Holst explained the error in accepting the Supreme Court as the ultimate arbiter of constitutional fidelity. “Moreover, violations of the Constitution may happen and the injured cannot, whether states or individuals, obtain justice through the court. Where the wrongs suffered are political in origin the remedies must be sought in a political way,” he wrote. Finally, in his statement discussed above, Governor Ducey of Arizona cites the provision of the U.S. Refugee Act requiring the federal government to consult with states prior to placing refugee populations. With respect to the difficult and potentially dangerous position in which Governor Ducey and the other 30 or so state executives find themselves, one wonders where in the Constitution states are required to ask the federal government’s permission to exercise a power they specifically retain under the Bill of Rights, namely the power to grant or refuse permission for entry into their sovereign territory to an immigrant, no matter what label that immigrant is given by the federal government. This article originally appeared in The New American Magazine, and is used with express permission. This article originally appeared in <a title="The New American Magazine - Website" href="http://www.thenewamerican.com/"><em>The New American Magazine</em></a>, and is used with express permission. TEXARKANA, Texas – Rep. John Ratcliffe (R-Texas) announced a major economic development win for the greater Texarkana region at a ceremony Thursday in New Boston, Texas. The TexAmericas Center will receive a designation by the U.S. Small Business Administration (SBA) as a Historically Underutilized Business Zone (HUBZone), which will bolster its ability to attract new businesses and create jobs. 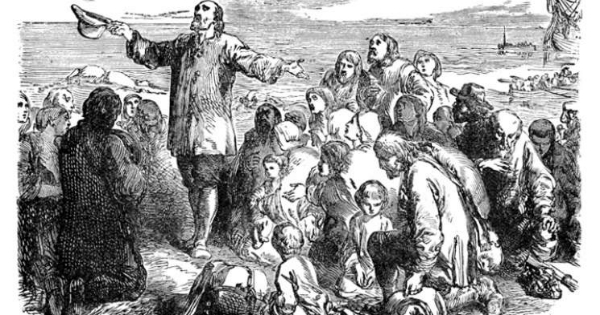 There is much truth in the stories regarding our Pilgrim Fathers and the First Thanksgiving they celebrated with the Indians that shared with them. The Founders never envisioned the Supreme Court to be the ultimate arbiter of practically every social and political dispute.